Personality: Light's personality can easily be described by one word. He is in a sense, a sociopath. He is always putting on a superficial charm, in an attempt to befriend all who he meets when in reality he is investigating them. He is a pathological liar to the extent that he may seem completely innocent. He also holds deep seated rage, which is split off and repressed, at the core. Does not see others around him as people, but only as targets and opportunities. Instead of friends, he has victims and accomplices who end up as victims. The end always justifies the means and he lets nothing stand in their way. When showing what seems to be warmth, joy, love and compassion it is more feigned than experienced and serves an ulterior motive. Outraged by insignificant matters, yet remaining unmoved and cold by what would upset a normal person. Since they are not genuine, neither are his promises. He is unable to empathize with the pain of their victims, having only contempt for others' feelings of distress and readily taking advantage of them. Not concerned about wrecking others' lives and dreams. Oblivious or indifferent to the devastation caused. Does not accept blame, but blames others, even for acts he obviously committed. He is very contemptuous of those who seek to understand him, believing them to be working for L. He is also very secretive, Has an emotional need to justify their crimes and therefore needs their victim's affirmation (respect, gratitude and love), Incapable of real human attachment to another ,Unable to feel remorse or guilt, May state readily that their goal is to rule the world, and Extreme narcissism and grandiose. 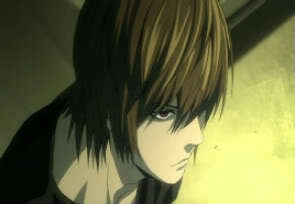 Light Yagami is a sociopath who wishes to create a new world free of evil and rule over it as a god. Bio: All his life, Light Yagami was raised and taught to stand up for justice. He was your typical above average, top of the class high school-er. A young genius who yearned to follow in his father's, Soichiro Yagami's footsteps, and become a police officer or a detective for that matter. In the past he helped solve many cases alongside the Japanese police until, he found out a terrifying truth. That in this world, justice has it's limits and known criminals are walking the streets. A part of Light strives to become the best so that he may work hard to put them away for good...but this was simply unforgivable. It was a common problem that Light thought need a solution. 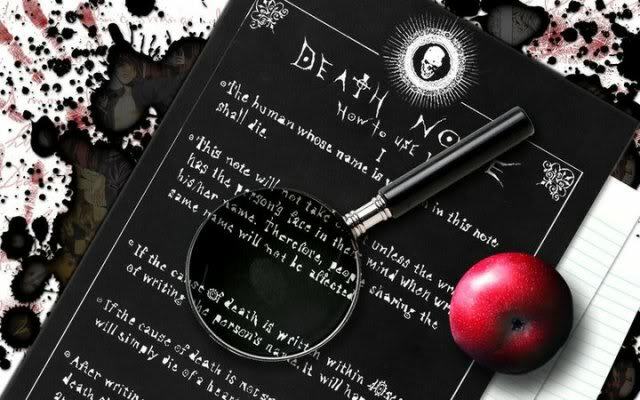 He was contemplating that topic one day, on his way home from school when he found a mysterious black note book entitled, Death Note. Needless to say, Light believed it to be a prank but something about it....some strange feeling overcame him. He just had to try it once. He took it home and locked himself in his room to examine it. He flipped through a few pages and found it to be blank. Upon reaching the inside cover, he read the following rules. The human who's name is written in this note shall die. this note will not take effect unless the writer has the person's face in their mind when writing his/her name so people sharing the same name will not be affected. Once a name is written, details of the death should be written within 6 minutes and 40 seconds. If no cause of death is specified, the person will simply die of a heart attack. Light became more and more enthralled by this note book and just had to test it. On the news there was a school kidnapping. The man's name was Kurou Otoharada. Light thought he would make a fitting test subject so he wrote down the name. He waited a minute. Nothing happened, so he moves to turn off the TV but finds the hostages swarming out of the school unharmed. Police stated that the hostages said he just collapsed and died. Light was caught off guard. Had he really KILLED someone? He had to test it one more time just to make sure so, the next day, Light took a walk. 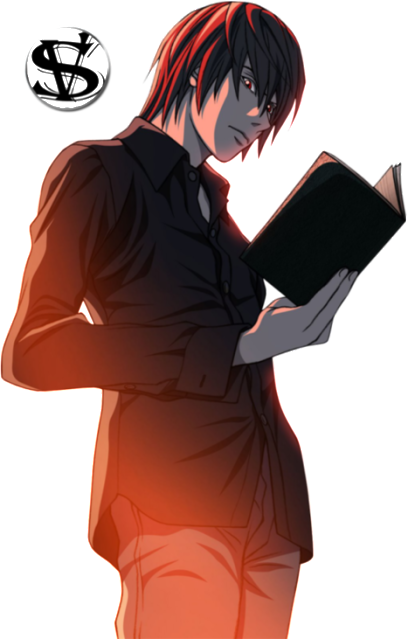 He knew it was too dangerous to just carry the death note around so he simply brought a single page kept folded up inside his wallet. He saw a young girl being harassed by a Takuo Shibuimaru and decided o walk in the nearby store, acting as if he were looking through one of the quiz books in the store's window section and took out the page. Unsure of how the name was spelled, Light wrote the name with various spellings and specified cause of death then watched what happened. The girl escaped, Takuo followed after her on his bike but was hit by an oncoming truck. Takuo immediately died of accidental death. Light knew now. This note book was real. With it's power he could change the world for the better. The perfect world he has always dreamed of. In which, he will rule as a god. Millions of thoughts were pouring through Light's mind. He had the power to kill anyone he wanted. All it takes is a name and a face. Everywhere he looked, he saw people was were useless and deserved to die and with his new power, he could correct that minor problem. Light was at the top of his class, even if he wasn't paying attention, you could bet he always had the right answers. After school, Light was on his way home. His deathnote tucked away in a drawer safe at home. He couldn't wait to punish more criminals. Death was the merciful thing to them, compared to what Light believed they deserve. He made it to his home and knocked twice. His mother Sachiko opened the door to greet him. "Good afternoon, Light. Did you have a nice day at school?" She asked. Light walked in and removed his shoes a the door. "Well, you know, same as always I guess. "Light replied, moving to the kitchen to get a drink. He turned around and saw his mother holding her hand out. "Huh? Oh..right. My report card. "Light muttered, reaching into his backpack and handing it her. She took it and looked it over. "Wow, still top of the class. I'm so proud o you!" She exclaimed. Light simply headed up the stairs. "Yeah, yeah.."He muttered. He raised his hand to open his bedroom door when, his mother called up to him. "Is there anything you'd like dear? You can have anything you want, you know. "She asked. Light called back in reply as he opened his door. "No thanks, mom. "He called back, before closing his door and locking it. "I've already got what I want.."He muttered, moving to his desk and pulling out his death note with a grin. "The death note is everything that i need...and with it, I'll become a god...all that I need...is a name, a face, a pen, and this notebook....and all who stand in my way....will die." Light grinned as his pen happily scraped against the pages of the death note. Soon the whole world would bow to him. He leaned back in his chair, giving off a small cackle. "Soon..the entire world will know of my existence..."Light muttered.